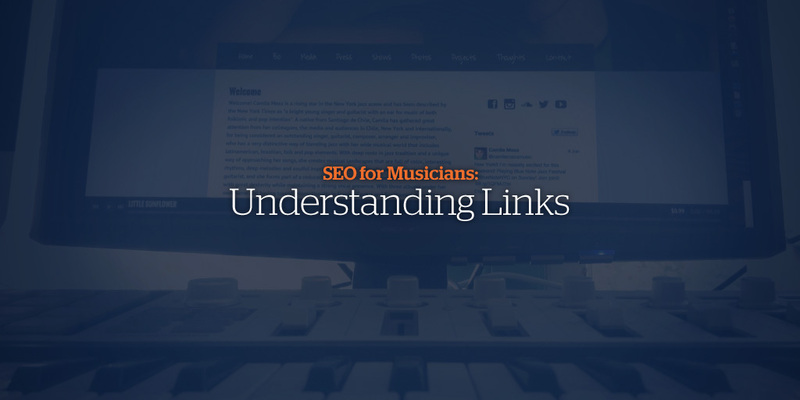 "So you're looking to continue to improve the SEO for your band's website. After reading 3 Tips to Optimize Your Website Content, you've added some great website content and customized your page titles. What's next? One of the most important things you can do to help with your website’s SEO is link building. Think about it this way: one friend told you to check out a musician’s website. Then ten friends told you to check out another musician’s website. Which one would you likely visit first? In a similar way, Google takes recommendations in the form of links and compiles them. Then it selects websites with many links pointing to them as more trusted. So the more high-quality websites that link to yours, the higher your website will place in search engine results. Links are one of the best ways to signal to Google what your website is about, and to improve your ranking in search engines. Let’s take a look at some places you can build links. Popular music blogs: Contact local music blogs about an interview, a music review, or doing a guest post for them. Online newspapers: Playing a local event? Your community likely has a few online newspapers that will promote it ahead of time in a 'weekly picks' column, or even a full article. Festival or event websites: The majority of events you will play have a website and want to promote you. Creating a press kit with promo images and bio is standard, and make sure when they add your info, they also add a link to your website. Venues: Most venues from pubs to sit down music clubs have a website where they create sections for the artists. Make sure you're listed along with your website. Podcasts: Besides audio, most podcast websites will include text information about the content. Seek out music podcasts and sit in as a guest, or ask for a music review. Social Media links: Linking to your website on social media outlets like Facebook and Twitter is a great idea. These links may not hold the same kind of weight that an external website would, but they still help, and are easy to share. Plus the more people that see your content, the more likely they are to link to it. As well as links to your website, the text used when linking helps search engines understand the context of the link. Anchor text are the words you use when creating a link. Using detailed words, like 'folk rock group from Toronto' as the text linked to your website is more useful than just writing 'click here'. If external websites link to your website using specific words, Google will know that your site is a good match for those words. So anyone typing in 'folk rock group from Toronto' to the search engine is more likely to find your website. You don’t have to use the exact same words each time, but the words should be descriptive. Think of how your link will fit in with the content it's presented with. The website it appears on, the page on the website, and the words around your link also help Google understand the context of the link. So focus on creating a high-quality website, and update it often with good content to encourage people to share it! Open Site Explorer shows you websites linking to yours, and their influence. Google Webmaster Tools offers insight about your site in Google Search. Google Alerts can let you know if you’re mentioned online. I hope this helps you add a few links to your website. Be sure to always keep your website url in mind, and share it widely to get links back to you! Create a beautiful, professional website in minutes that has all the features you need, including automatic SEO optimization. Try Bandzoogle free now!"